George Mason, President of Nash Motor Company, had broad experience in engineering, manufacturing and finance. He was an industry leader in the 1940’s and ’50’s, and it was his decision to explore the possible production of a little two-seater. After the design phase was completed, the decision was made to have Auston Motor Co., Ltd. Of England build the car. The car would be available as a convertible or a hardtop. 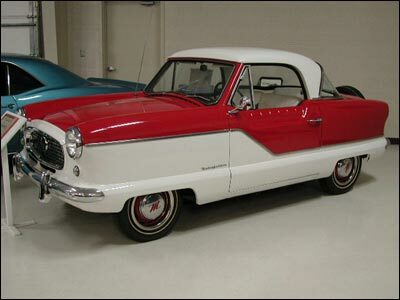 These cars were originally sold as Nashes; but later when Nash and Hudson merged to form AMC, the little car became known as the AMC Metropolitan. The Metropolitan was peppy, economical and fun to drive. All Mets had a rear mounted spare, a styling detail that mimicked the continental kits that were a popular accessory in the 50’s and 60’s. 1959 was the all-time best sales year for the Metropolitan with over 22,000 sold, and its popularity as an economy car was second only to the ubiquitous Volkswagen. But by 1960, the market was changing. Chrysler introduced the Valient, General Motors the Corvair, and Ford the Falcon, these compacts were bigger, more powerful and could be ordered with automatic transmissions. The youth market was hooked on horsepower, and gas was cheap. Sales declined, and two years later the Metropolitan was discontinued. The 1961 Metropolitan on display was one of the last Mets built. It sold new for about $1,800.